The World Culinary Olympics are held every four years and attract more than 42 countries, each competing at the very highest level. The competitors are assessed by World Association of Chefs Societies’ accredited judges, who demand the very highest standards of global culinary excellence. They look for the most creative and innovative food that can realistically be served in any fine dining establishment throughout the world. The Combined Services Culinary Arts Team was formed in 1997 to represent the UK Armed Forces in both national and international competitions. 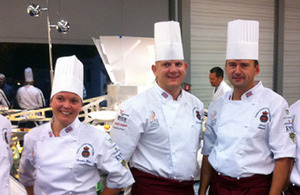 They have competed at the World Cup in Luxembourg amongst other national and international events and are selected on the merit of both their culinary and professional military performance. The reputation of the squad is hugely recognised and respected throughout the culinary world owing to the plethora of medals they have previously achieved. The team competed as Team GB in two sections of the competition, ‘The Restaurant of the Nations’ challenge and the ‘Cold Buffet’. The first part of the challenge involved preparing, cooking and serving 150 covers of a three-course menu suitable for fine dining under test conditions. The chairman of the judges commended the team for their tenacious efforts and methodical manner in which they performed; he further added it was yet again a joy to watch the British Armed Forces team at work. The second part of the competition involved designing seven menus for static display. These menus had to represent the same standards of ‘The Restaurant of the Nations’, ensuring each menu was original, innovative, practical and well-balanced. There was a meal suitable for field catering, one suitable for vegetarians and one which took the form of an exquisite five-course gourmet menu. The team, governed by Defence Fuel and Food Services, is managed by Warrant Officer Dale Hegarty RAF and team captain Warrant Officer Class 2 Simon Atkinson Royal Marines who have both served for more than eight years on the squad. The other main team members are Warrant Officer Class 2 Nathan Kelsey British Army, Sergeant Smith RAF, Sergeant Karl Bartlett British Army, Corporal Taff Davis RAF and Private Candice Kotze British Army. They are all supported by a small group of logistics volunteers whose invaluable input contributed directly to the success of the team. This is the first time the team has ever achieved ‘Double Gold’ in the Olympics, an outstanding achievement. They were highly commended for their efforts and finished second in the world overall, only beaten by the Swiss by 0.7 per cent. The team will resume their normal duties with immediate effect until training workshops begin again in June 2013 in preparation for Hotelympia in London and the World Cup in Luxembourg in 2014. An outstanding display of our professionalism and excellence within the UK Armed Forces that demonstrates an ability to directly influence operations and equally compete against some of the finest chefs in the world.